Whether you have an apartment or house, living in a large urban centre such as London means it is very likely you have relatively small rooms. Below is a selection of the best solutions to make the most of your physical and visual space. Choosing only what you need and scaling your furniture are very important when working with smaller spaces and are often forgotten. Make use of those neglected spaces, for example the space underneath the staircase, which can be used for extra shelves or drawers. Bespoke furniture is an amazing way to optimise your space, built-in cabinetry offers a great solution when it comes to storing personal items. Urban apartments which are housed in industrial buildings tend to have high ceilings, to make use of this space, try going vertical, for instance, by using tall bookcases. Placing mirrors in the dining area, living room or in the bedroom will make your room look bigger. Using mirrors is an interior design trick that works wonders, especially when placing mirrors across from a window, enabling them to receive and reflect more light. You will all agree that light colours will make small spaces feel more open and spacious, but do not be afraid to add a little colour to the room. Pastels and neutrals are always safe choices to liven up your room but do try to stay away from big patterned wallpaper and dark colours; they will easily make a room feel closed in. Open plan kitchens or a kitchen extensions can completely change the way your home looks and feel. Removing a wall to open up the kitchen and connecting it with the living room can give an amazing new spacious feel to your home and a kitchen extension is a fantastic way to increase your living space whilst adding value to your home. To create space in your kitchen and dining area, you can add a breakfast bar to your kitchen or save drawer and cupboard space using other clever ways to storage your things. Think of a magnetic knife rack or a hanging pot rack above your kitchen island. If your kitchen happens to be adjoining the garden, ideally the space will be able to open up to bring the outside in, with patio doors being a great option. With patio doors, you will make your kitchen look extended and larger than it was before. Another way to make your kitchen look more spacious is to use gloss units and reflecting surfaces in your kitchen interior design. The bathroom is the place where you go to relax or rejuvenate yourself with a hot shower. You do not want your interior design making it feel like the walls are closing you in. For your privacy you will need at least one wall, but solid walls will make the room look smaller, whereas glass or frosted sliding doors will let in light, making your bathroom airy and open. Larger tiles will make a small space seem bigger, but surprisingly, so do very small tiles such as mosaics. An absolute must in smaller bathrooms is good lighting. 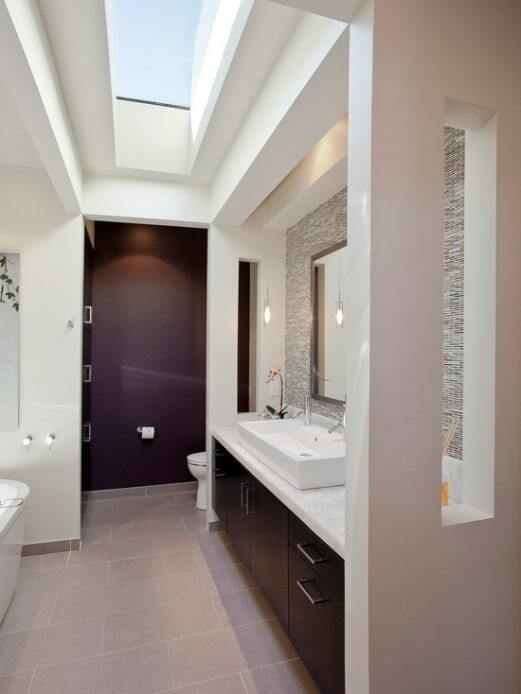 Having a loft bathroom would enable you to put in a big skylight, but if small windows are your only option, undress your windows and replace the glass with frosted panes. Have halogen spots installed; they mimic natural daylight and will instantly make your bathroom look larger.